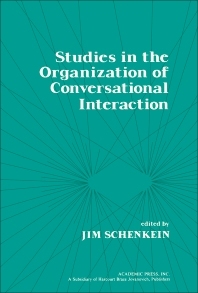 Studies in the Organization of Conversational Interaction examines the different features of conversational interaction, which reflect a vigorous research paradigm for the study of natural conversations. This book discusses the naturally occurring interactions that have been recorder and transcribed. Organized into 10 chapters, this book begins with an overview of the turn-taking system for conversation and explains that the organization of taking turns at talk is one type of organization operative in conversation. This text then discusses encounters with strangers that only conduct their business under the auspices of their official identity relations. Other chapters consider the production of compliment responses, which are sensitive to the cooperation of multiple constraint systems. This book discusses as well the conversational activity of telling stories and listening to stories. The final chapter deals with an analysis of a dirty joke. This book is a valuable resource for sociologists, conversationalists, linguists, grammarians, and anthropologists.